In small bowl, mix garlic salt, onion powder and salt. Rub beef with mixture. Spray 5- to 6-quart slow cooker with cooking spray. Place beef in slower cooker. Pour 1 cup of the soup over beef. Remove beef from slower cooker; skim fat from juices. Use 2 forks to pull beef into shreds; mix beef with reserved juices and remaining soup. Spoon into buns; top with cheese. 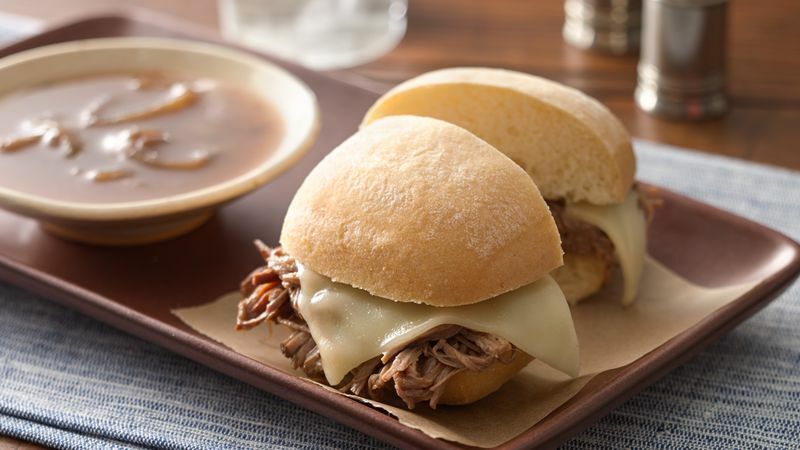 Serve sliders alongside a bowl of soup. The advance prep on this dish can be done the night before. Then place in slow cooker in the morning to come home to a delicious dinner.